The Oyster Perpetual formed the foundation for Rolex's success and still remains one of the most popular luxury watches worldwide. This streamlined stainless steel watch united a waterproof case and an automatic movement with a rotor for the first time. The Rolex Oyster Perpetual serves as the perfect introduction into the world of the most well-known Swiss luxury watch manufacturer. At the same time, it's the ultimate classic Rolex, the mother of all Rolex watches. Robust and water resistant to 100 m (328 ft), halfway between sporty and elegant, the Oyster Perpetual is the perfect companion for every occasion. It looks just as great with a polo shirt as it does with an evening suit. The 26-mm and 31-mm models were designed with women in mind while the 34-mm, 36-mm, and 39-mm versions are geared more toward men. Rolex brings together their most important inventions in the Oyster Perpetual. The manufacturer was a trailblazer in two areas of watchmaking: in their use of a sealed case and a winding rotor. Most other Rolex watch series are based on the Oyster Perpetual, whose base model is still a simple three-hand watch with central seconds. The name of each watch is completed by a number indicating its case diameter in millimeters. How much does a Rolex Oyster Perpetual cost? 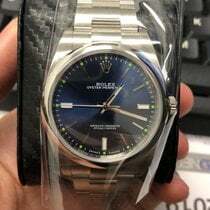 The highly coveted Rolex Oyster Perpetual 39 with the reference number 114300 costs around 5,300 USD new and 5,200 USD pre-owned. 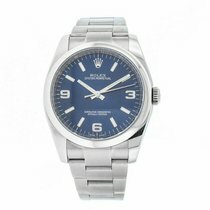 This stainless steel watch comes with a rhodium, blue, or red grape dial. The 36-mm version with the reference number 116000 also comes in a variety of dial designs and colors. You can get a ref. 116000 in mint condition for 5,100 USD, while a pre-owned model goes for about 4,400 USD. The 34-mm editions with the reference number 114200 are even less expensive and sit around 4,800 USD new and 4,200 USD pre-owned. Unlike the Oyster Perpetual 39, which is powered by the in-house caliber 3132, the smaller unisex models are powered by the caliber 3130 and lack the Paraflex shock protection system. 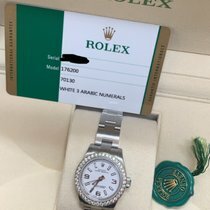 You can find small 31- and 26-mm women's watches in the Rolex Oyster Perpetual series for as little as 4,700 USD and 4,400 USD, respectively. Pre-owned examples cost a few hundred dollars less. Regardless of whether it's a men's, women's, or unisex model: overall, Oyster Perpetual timepieces tend to retain their value. Those who appreciate the practicality of watches with a date display and cyclops lens should take a closer look at the Oyster Perpetual Date and the Datejust. A new, 34-mm stainless steel Oyster Perpetual Date ref. 115200 demands around 5,800 USD new and 4,900 USD pre-owned. The same luxury watch made of stainless steel and white gold costs about 7,700 USD new, though pre-owned models cost only 5,900 USD. If 34 mm is too small for you, perhaps you would prefer the 41-mm Datejust 41 or the somewhat older Datejust II, which was still equipped with the caliber 3136 and is no longer in production. The caliber 3235 with a Chronergy escapement and a 70-hour power reserve ticks away inside the Datejust 41 from 2017. Plan to spend around 7,300 USD for a stainless steel model in mint condition. You can purchase a pre-owned stainless steel Datejust II for about 6,800 USD. In 1931, Rolex introduced a technological advancement: the perpetual rotor, from which the Oyster Perpetual gets the second half of its name. 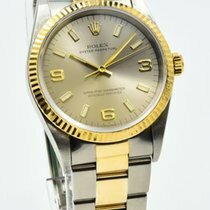 Rolex was the first to develop a self-winding wristwatch with a perpetual rotor. The mechanism is made up of an oscillating weight (the rotor) which has a delayed reaction to movements. This delay between the rotor and the rest of the watch winds the mainspring. The mechanism was patented in 1932, and not much has changed in the meantime. The first perpetual rotor, however, wound unidirectionally, while bidirectional self-winding movements have become the standard since the 1940s. Other manufacturers have long since begun using this technology from Rolex as well. The look of the new Oyster Perpetual is characterized by stainless steel. Rolex uses type 904L, which is considered especially corrosion- and scratch-proof. Rolex uses this stainless steel for the case as well as the bracelet and its three-piece links. Oyster Perpetuals from earlier decades, however, are also available in gold. The watch features a screw-down Twinlock crown, which has two gaskets to prevent water leaking in and damaging the watch. Therefore, thanks to this special crown, the Oyster Perpetual is water resistant to 100 m (10 bar, 328 ft). In the 1920s, oysters served as the inspiration for the name of this Rolex series. Oysters seemed a perfect choice, as the underwater creatures' outer shells protect them and keep them dry. At the time, Rolex was a pioneer in the area of waterproof watches. The first version of the Oyster case premiered in 1926. On October 7th, 1927, English swimmer Mercedes Gleitze wore a Rolex Oyster as she became the first Englishwoman to swim the English Channel. The Oyster survived the conditions just fine, proving it to be the first waterproof watch. Gleitze had worn the watch for around fifteen hours in cold water. The words "Oyster case" have become an established term in the watch world. It doesn't just signify this model, but rather all Rolex watches with a similar design. Distinctive characteristics include a solid Monobloc middle case and a screw-down case back. The back has a fluted edge, which allows watchmakers to open the case for repair and maintenance using a special tool. Due to the many different case sizes, Rolex uses various movements in the Oyster Perpetual collection. Caliber 3132 powers the 39-mm version with reference number 114300 ; the 3132 also ticks away inside the Explorer. The rotor winds bidirectionally and helps the movement achieve its power reserve of approximately 48 hours. One characteristic of the 3132 is its precision; according to Rolex, it deviates no more than two seconds a day from the reference time. Therefore, it easily passed all tests from the Official Swiss Chronometer Testing Institute and is COSC-certified. By pulling out the crown, you can set the time to the exact second. A defining feature of the 3132 is its Parachrom hairspring made from a non-magnetic zirconium-niobium alloy. This important component is ten times less affected by shocks than conventional hairsprings. Furthermore, Rolex's Paraflex shock protection system protects the movement in extreme conditions. Rolex also uses a movement with a Parachrom spiral in the smallest Oyster Perpetual models. Caliber 2231 powers the 26-mm version; the movement barely differs from the larger 3132 movement in terms of precision and power reserve. The 2231 also powers the next size up, the 31-mm version. The 34-mm models are available with or without a date display. Rolex uses caliber 3135 in this watch, a very reliable, COSC-certified movement which also powers diving watches like the Sea Dweller 4000 or Deepsea. The versions without a date display are powered by the 3130. The optional date display with the typical Cyclops lens is not the only extra on the 34-mm Oyster Perpetual Date. The women's model with reference number 115234 has sparkling diamond index markers for odd hours and features a white gold and 904L stainless steel bracelet. For a further elegant touch to the watch, Rolex added the option of a fluted bezel. Altogether, the watches in the Oyster Perpetual collection feature subtle, simple designs. The olive, red grape, and champagne dials stand out with their bold colors in comparison to the graphite, white, and dark blue dials. The thin, straight, no-frills hands are partially filled with luminous material, allowing you to read the time even in the dark. Hour markers are usually thin lines, although Arabic and Roman numerals are options as well. 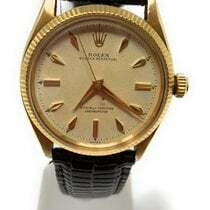 The 12 o'clock marker is represented by Rolex's logo, the five-pointed Rolex crown. Even the bracelet has a name of its own: the Oyster bracelet. It has been in production since the late 1930s and consists of flat three-piece links. A series of these three-piece links are added together, building a full-length Oyster bracelet. However, using the patented Easylink rapid extension system, you can change the bracelet length so it's a comfortable fit for you. Many of Rolex's most famous watches, such as the Submariner, Daytona, and Explorer, belong to the Oyster Perpetual family.